Pack your mosquito net because you’re about to embark on a tropical journey deep into the Jungle. 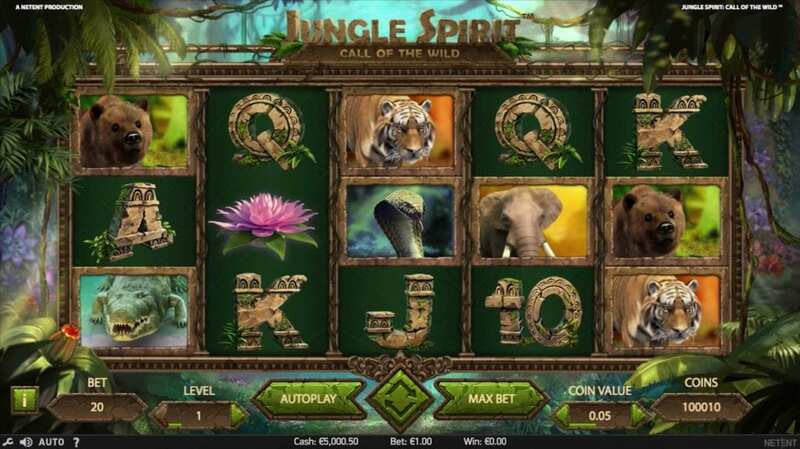 This 5 reel, online video slots game brings the uncertainty of nature to your own home with its intense tribal drum and monkey scream soundtrack. Spin the realistic game board that has been constructed among the vines and encounter roaring tigers, grizzly bears and hissing pythons. Play now to win some huge cash rewards, free spins, and bonus Wilds. Try online slots in the UK now! NetEnt was founded in 1996 and since has become a leading provider of spin slot games. Their player-centric games are beautifully designed and are packed with bonus rewards. 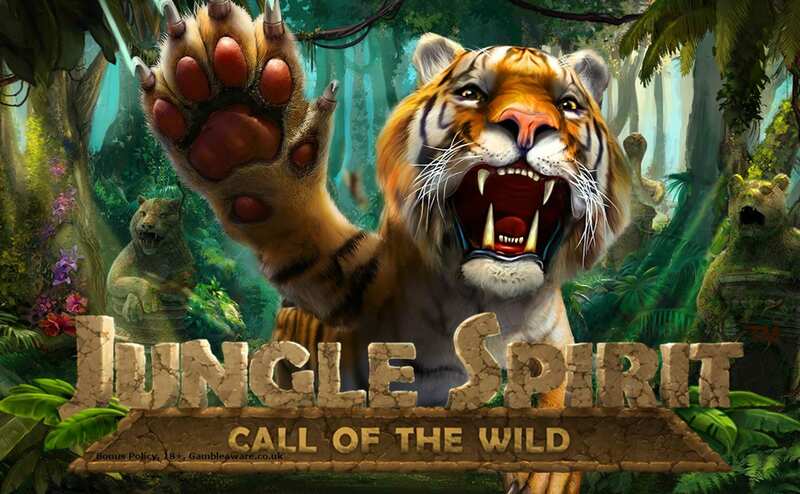 Jungle Spirit: Call of the Wild is exemplary of the video slot game genre and will not disappoint gamers both new and old. Styled with the latest 3D graphics, the hung vines, rich green foliage and glowing butterflies and the up-tempo music will make you feel as if you have taken a step into the jungle. On the reels, you will see fierce creatures side by side – the ferocious tiger, a grinning crocodile, a hypnotic cobra, a pensive elephant and a bear. The familiar fruit symbols are made of ornate stone, weathered by years of exposure to this environment’s humid atmosphere and covered in natural green growth. This game has a huge potential to become the best UK online slot games in the industry. The game is built with 5 reels, 3 rows and 243-1024 bet lines and as you would expect it can be played on desktop, mobile and tablet devices. Spins start at 20p and can go up to £100. This stunning game also comes with 3 bonus features: the Symbol Expansion feature – each symbol in the game is marked by butterflies. If those marked symbols take part in a winning combination in both the main game of Free Spins, it expands to cover the entire reel. There is also a wonderful Butterfly Boost feature which can be activated at any given point during the main game. The butterflies fly around the reels and expand across the symbols that make up the components of a winning spin. When expanded, they take over the whole reel. In addition, discover the free spins feature which is activated when 3 or more flower symbols appear anywhere in the main area game. If you get 4 scatters symbols, you will also win 15 times stake bonus. If you’re lucky and get 5, you will win a 50 times stake bonus. Once you trigger this wonderful addition there are over 1043 ways to win. You also have the choice of 1 – 5 free animal spins. In this feature, the animal you choose will be the only symbol on the reels, so choose wisely! Each animal gives you a certain amount of free spins with no more free spins to be retriggered. Here are your options: Tiger (4 free spins), Elephant (8 free spins), Bear (12 free spins), Crocodile (16 free spins) and Cobra (20 free spins). While getting more free spins is appealing, the lower free spins mean a higher value symbol which offers a greater win potential. Cobra might mesmerise you with its 20 free spins, 5 of those will give you 60 coins whereas 5 of the Tiger will give you 150. Lose yourself in the beauty of Jungle Spirit: Call of the Wild and enjoy the sights and sounds of the wild. This game is not only beautiful to look at it is filled with some impressive bonus features and free spins that keep you coming back for more. This excellent offering from NetEnt cannot be missed and really encapsulates a realistic jungle setting. Wizard Slots rates this game 9/10. Another truly amazing game is our Wild Wild West slot.